The stunning Villa La Foce is located on a hill overlooking the Val d'Orcia, a beautiful and miraculously intact valley in Southern Tuscany. Villa La Foce was purchased by Antonio and Iris Origo in 1927. 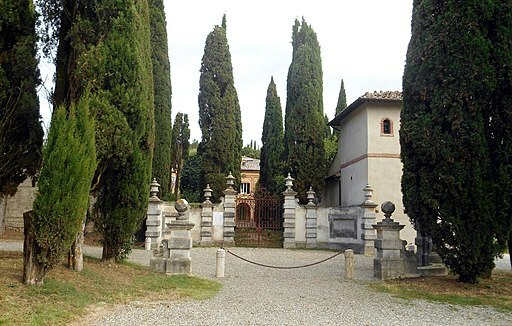 They engaged the English architect Cecil Pinsent, who had previously done extensive work on Bernard Berenson's Villa I Tatti in Florence, to restructure the main buildings and create a large garden. 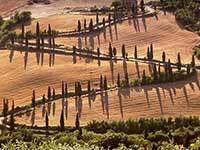 The area of Val d'Orcia is a part of the agricultural landscape of Siena, which was developed and redrawn when it was made a part of the city-state in the 14th and 15th centuries. Named to UNESCO's World Heritage Site list, Val d'Orcia is famous for its representation of the Renaissance's ideal landscape and good government. Here the hills’ soft shapes melt one into another, now and then interrupted by spacious valleys of cultivated land showing off the varying colors of the seasonal crops. The famous cypress road that winds up a hill, one of the most photographed views of Tuscany. But they also have a story, for they were planted by Marchese and Marchesa Origo (the writer Iris Origo) as part of a scheme to improve the landscape of what was then among Italy's most desolate regions. They also, no doubt, softened the view from the masterpiece the idealistic young couple created nearby, at what had been until their arrival a wayside inn: one of the most dramatic twentieth-century gardens. 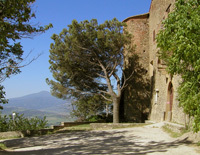 A view across the garden towards a horizon dominated by the volcanic peak of Monte Amiata. 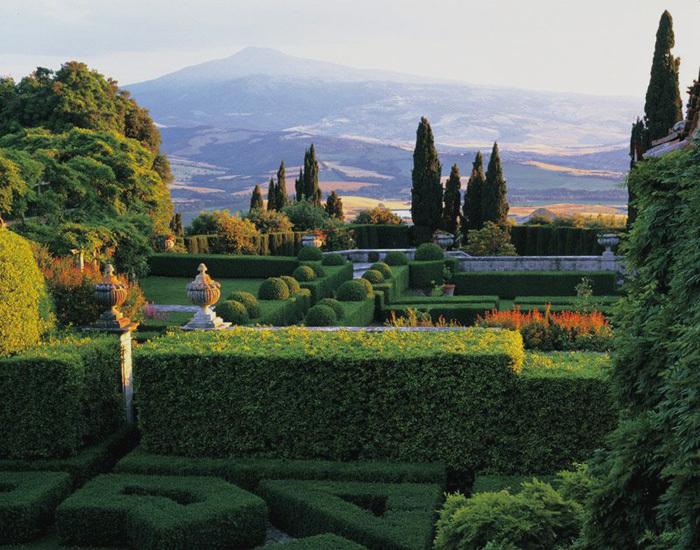 View of the formal landscaping below the belvedere in the garden at La Foce in Tuscany. The harmony between this garden and the surrounding nature makes la Foce an ideal example of Tuscany’s architectural and cultural evolution in the 20th century. Incontri in Terra di Sienaa is a chamber music festival with an eclectic programme featuring internationally-known musicians in the incomparable settings of Villa La Foce and the Val d'Orcia. Artistic Director Antonio Lysy brings together rising stars alongside world-class musicians. 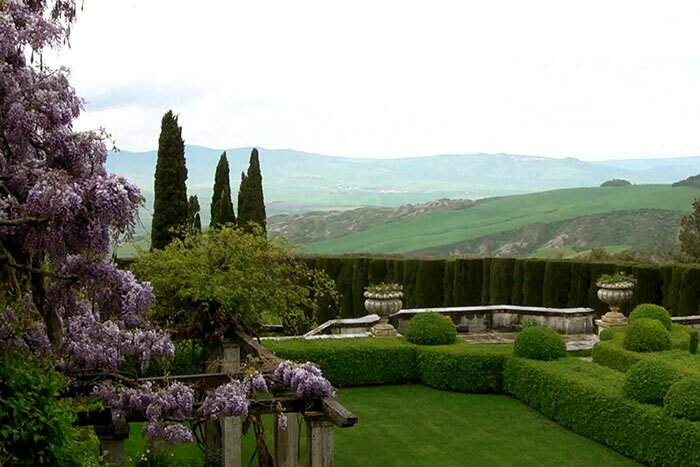 Based at Villa La Foce and the nearby medieval castle, Castelluccio, Incontri's aim is to spread the appreciation of music and art through concerts, meetings, and artistic events held in the many beautiful neighbouring towns that include Pienza, Radicofani, Cetona, Città della Pieve and San Quirico d'Orcia. 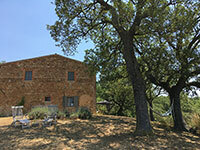 The Incontri in Terra di Siena is a key part of a wider initiative to sustain the area, the passion that originally drove Antonio and Iris Origo. 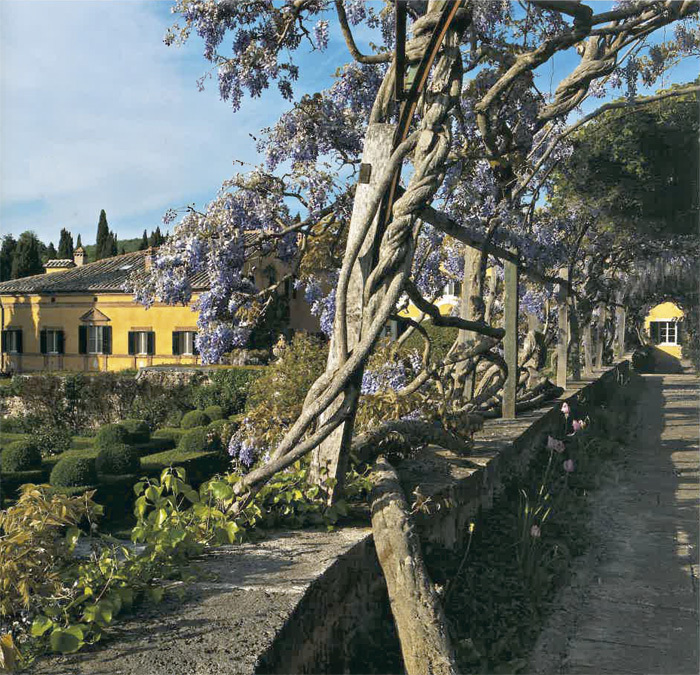 I cipressi e Villa La Foce, l'ultimo giardino di Iris Origo e Cecil Pinsent Ingresso di Villa La Foce. #travelingintuscanySan Quirico d' Orcia, la sua valle e i suoi cipressi. Questo articolo è basato sull'articolo Villa La Foce dell' enciclopedia Wikipedia ed è rilasciato sotto i termini della GNU Free Documentation License.